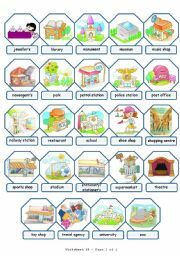 This is the first page of "Places in Town Pictionary", where you can find vocabulary related to shops and services. I´m sorry, but I had to divide it in 2, because it was too heavy. I tried to reduce it by turning it into a picture, but then the quality of the images was so poor that I´ve given up the idea... Hope it´s useful! Here´s the rest of the pictionary. Have a nice day everyone! 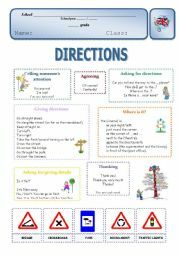 4-page worksheet: language functions for asking/giving directions, important words, exercise with map and prepositions (gap-filling), map and dialogue reading, writing a dialogue exercise. Hope it´s useful! 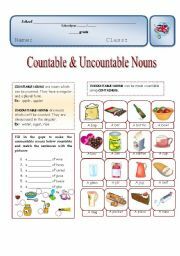 2-page ws: short explanations on countable/uncountable nouns, containers, much/many and some/any and simple exercises for sts to practise. Hope you like it! Here´s the second page. Hope it´s useful! 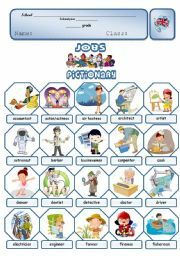 2-page jobs pictionary, alphabetically ordered. I had to divide it into 2 separate pages, because I couldn´t reduce the size to less than 300k... Hope it´s useful! 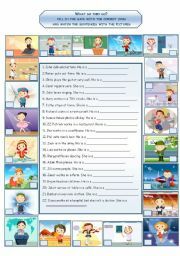 Students must match the sentences defining the job (tasks,workplace) with the correct image. Hope it´s useful! 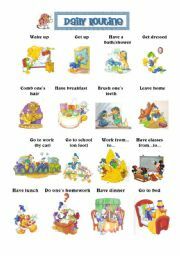 Vocabulary about daily routine. Hope you like it! Most images were taken from the book "Magic English: My first English Dictionary". 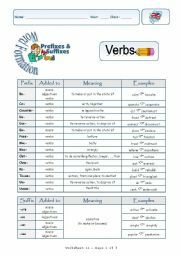 This is a 2-page ws on the most common prefixes and suffixes to form verbs. 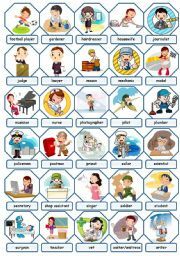 On the 1st page there is a table with the suffixes and prefixes, to which word class they´re added, their meaning and examples. On the 2nd page there are exercises on both. Hope it´s useful. I´m teaching the unit "country vs city" right now. This is the first of a series of Picture Dictionaries I´ve created for my students. Hope it´s useful! Have a nice day, everyone! 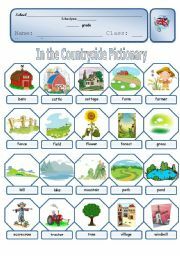 This is a very simple PPT to introduce St Valentine´s Day vocabulary to my 1st grade students. I hope it´s useful! A very simple PPT to introduce family members to my 1st graders. Exercise to practise the Emphatic Structure.